As economy is getting more worse and worse, people are paying more and more for fuel. People are much concerned about the amount they are spending for fuel. Have you ever dreamt of a car which gives 1000 miles per gallon. I am sure it looks unbelievable.Along with its amazing mileage this car has its own pros and cons. Its true. 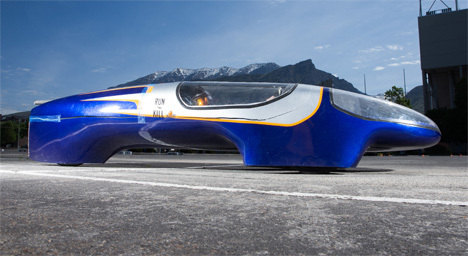 A Ultra-Efficient Super-Light car tops 1300 miles per gallon. This car was built to win SAE Supermileage competition 2013. People call this as BYU Supermileage vehicle. Though car looks bit odd, it waits just 99 pounds which can accommodate only one person who needs to lydown for drive it. Can anyone guess the top speed of this light weighted car ? Its top speed is 25 MPH. SAE supermileage competition 2013 doesn't bother about top speed, the main key is the mileage. That's the reason this car has won the competition 2013. 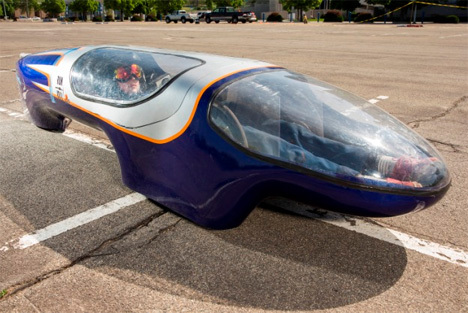 Earlier in 2012, BYU's entry reached 1135 MPG, but this hear they have focused on making a lighter and more aerodynamic car. They have reduce 22 pounds of their 2012 model by redesigning each and every part of their vehicle. Coming to the competition, every car is given 20 grams of fuel and is then driven around 10 mile track. The fuel remained is measured after the course to determine the fuel usage. Based on remaining fuel,they calculate MPG and declare the winner. Using these type of cards in real world may be diffuclt because of its light weight, low top speed and seating posture. But its fish like aerodynamic design looks great.